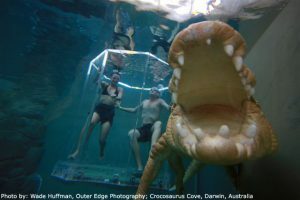 If you are an adrenaline junkie this may be an experience after your own taste: Crocosaurus Cove in Darwin, Northern Territory, Australia, offers you a unique experience in the “Cage of Death” where you will meet one of the seven resident crocodiles hosted here. A special built cage with reinforced acrylic panels has been put up to offer you a 360° view of the tank and its inhabitants: Australia’s largest and very curious saltwater crocodiles. If you are brave enough you can try it by yourself or bring a buddy to keep you company, as the cage can accommodate two persons. The cage is three meters high and it will be filled with water two-thirds, with the upper part, in the air, being covered by a protection grill to keep away the too inquisitive crocs. After a safety briefing, you will be immersed in one of the four separate enclosures, as the Crocosaurus Cove’s webpage lets us know and, for the next 15 minutes, you will be in the water (without any swimming aids, just goggles for rental) with one of the huge prehistoric creatures. If you are lucky you could meet the local croc star, Burt, from the renowned “Crocodile Dundee” movie. The retired old reptile, being around 80 years old, still impresses even at this age: he’s about 5 meters long, weights around 750 kilograms and he’s very cranky. I for sure wouldn’t want to meet his jaws in the wild… There is an age limit of 15 years for taking part in the “Cage of Death” adventure and the teenager must be accompanied by an adult. Sallie Gregory, Sales and Marketing Manager at Crocosaurus Cove, lets us know what else we have in store: “After your croc encounter, feel free to explore the various attractions also on offer. Enjoy informative and educational talks, witness the daily barramundi feeding, go «Fishing for Crocs» or wander around the «World of Crocs Museum» and check out the World’s largest display of Australian reptiles”. Children have the possibility of learning lots of interesting things, can hold a baby crocodile or attend feeding of turtles. The entrance ticket to the “Cage of Death” isn’t cheap, but surely your memories will last a life time: $148 Australian dollars (approximately 110€) for one person or $108 (≈80€) per person if there are two people entering the cage at the same time. 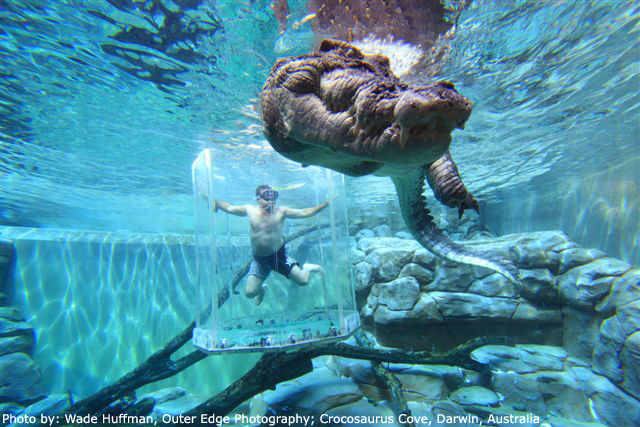 The fee includes a full day entry at Crocosaurus Cove. If you don’t want the “Cage of Death” experience, the entrance ticket is as follows: $28 (≈21€) per adult; $22 (≈16€) per senior; $16 (≈12€) per child. Families benefit from discounts. Asta e ca un sport extrem!